This dish is a great, healthy alternative to traditional pasta dishes. It is quick, & very easy to make, without compromising on taste. Boil the edamame spaghetti for 5 minutes as per the instructions on the brand you have purchased. Once cooked generously serve with walnut oil, & chopped plum tomatoes & spinach. Before serving generously sprinkle sesame seeds & salt & sea salt pepper to taste. 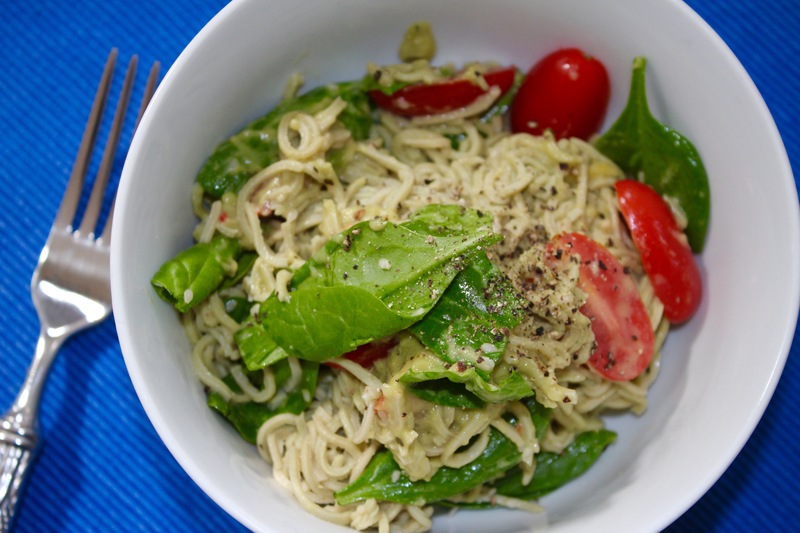 Edamame spaghetti is naturally gluten free & low in calories. It is a excellent source of iron, calcium, & plant protein. Walnut oil is a great source of omega-3 fatty acids & is rich in both vitamins & minerals. Sesame seeds provide so many amazing vitamins & minerals ranging from copper, manganese, calcium, magnesium, phosphorus, iron, zinc, selenium, vitamin B1 & fiber. They are also known for containing the type of fiber called lignans, which has been shown to have cholesterol lowering effect in humans & helps prevent high blood pressure. They also have a protective affect on the liver, especially against oxidative damage. Spinach is high in zinc & niacin, as well as protein & fiber. It contains vitamins A, C, E, K & thiamin, vitamin B6, folate, calcium, copper, magnesium, phosphorus, potassium & manganese. Plum tomatoes are a wonderful source of vitamin C, biotin, & vitamin K. They are also a good source of copper, potassium, manganese & fiber. They also contain vitamin A, B6, folate & niacin, vitamin E, & phosphorus.